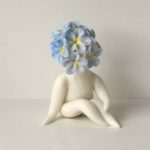 If you are looking for handmade Christmas gift ideas or unique Christmas gifts for her indoors, you have come to the right place. 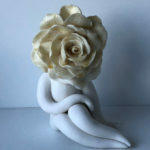 All of my ceramic flower sculptures or flower people sculptures are handmade and one offs. I dont use molds and each is sold. I sometimes make two or three of similar versions but on the whole they are unique and you won’t find another one the same. 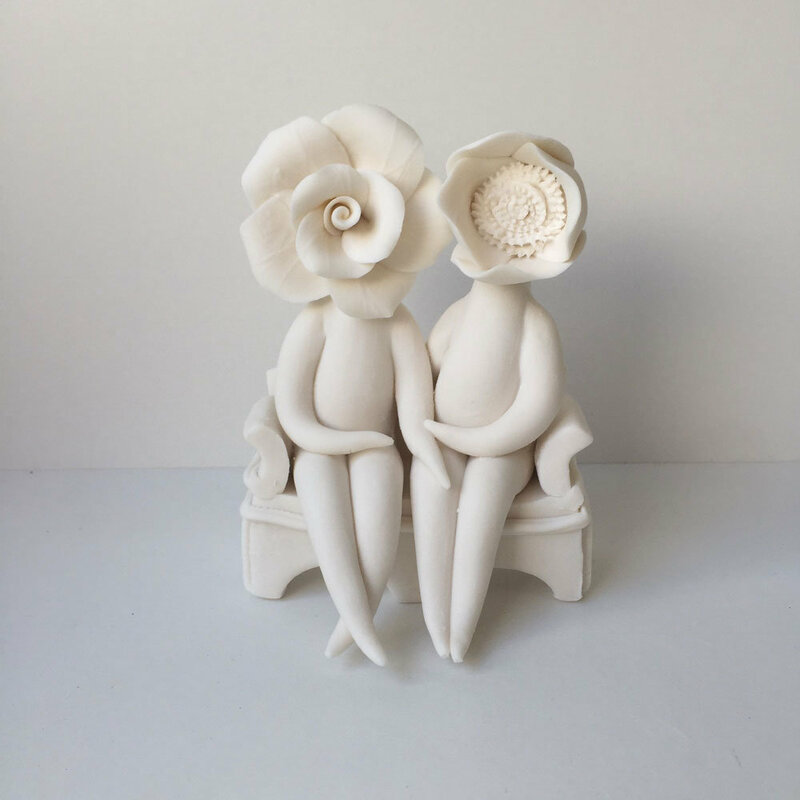 I have been handmaking my flower clay sculptures since November of 2013 and they are evolving all the time. I can make all types of flower heads sitting in any type of arrangement. My flower making skills have come from working as a part time demonstrator at Coalport China Museum. I was a natural and picked up the skill quick, I even knew I could make them before even trying. After 3 days of learning to make china flowers a couple of visitors asked me how may years it took me to perfect the skill..I replied 3 days. The rest is history. 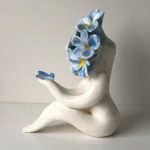 I can make a whole family set of flower people as a special commission which would make great family gifts for Christmas. A family could be sat on a sofa, sat on a log or anything else you can think of. Perhaps you want your pets sculptured also or a family and pets sat together. They could also be sat of the shelf types. Whatever you want I am sure I can make for you. The beauty of giving one of my ceramics sculptures as a gift to someone this Christmas is that they will get a one off unique piece of art which nobody in the world will have. 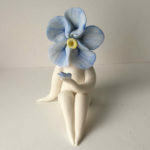 My flower people are currently in 4 shops around the UK, and 1 in America. More shops are waiting on me. The best ones get sold right here off my website. They are very hard to make and its took many mistakes and broken ones to get to where they are today. Still today I am learning and each firing brings more surprises. Or perhaps you have a friend who is just crazy about sunflowers. 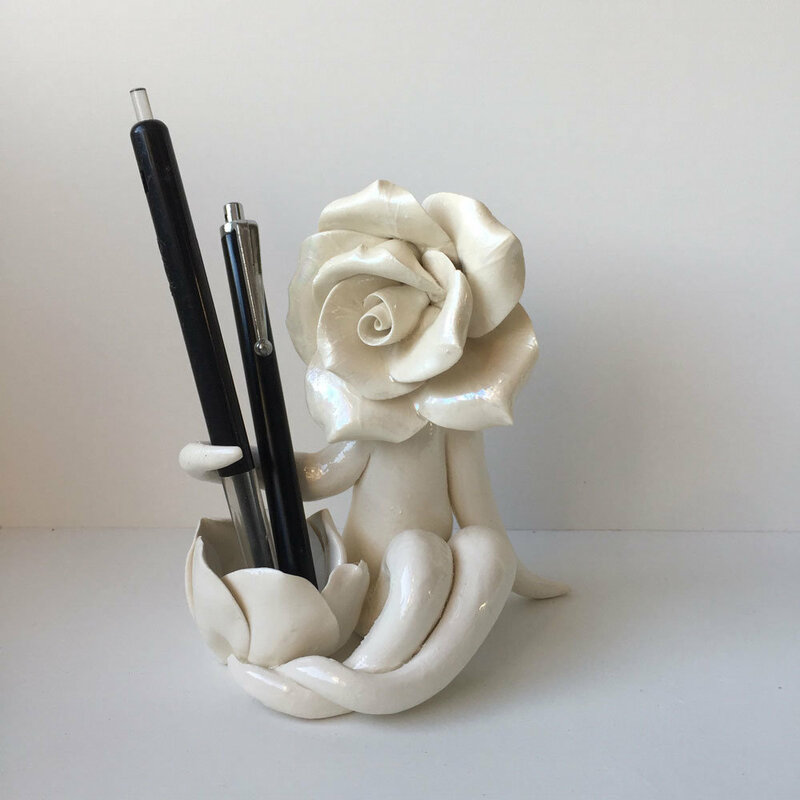 I can create a unique flower clay sculpture to your exact requirement. 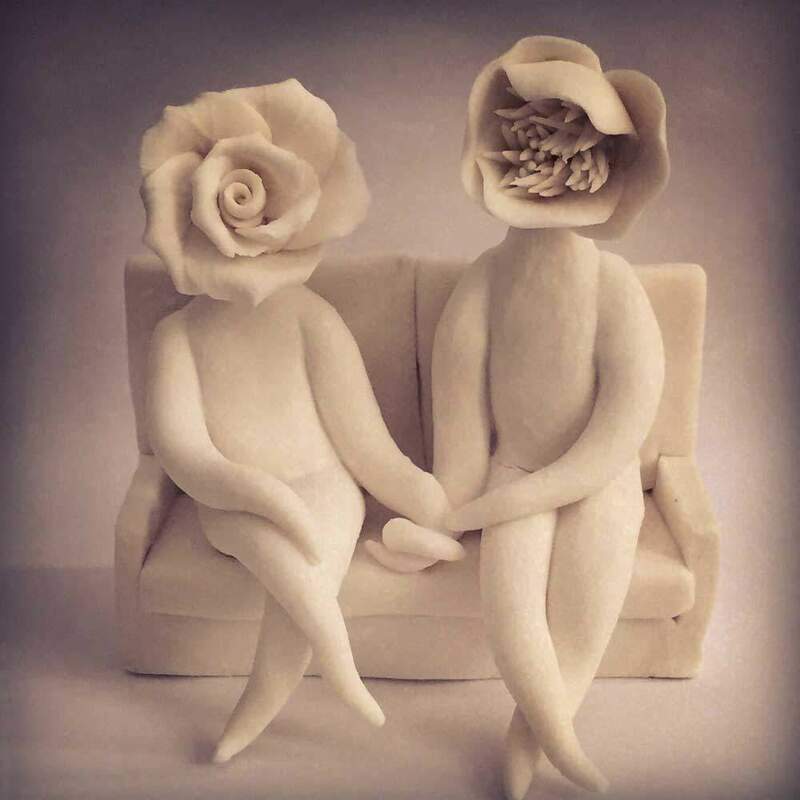 Obviously it will be my representation of what you want but if you take a look around my website you will see some lots of art sculptures for sale which will give you an idea of what I can create. If your looking for Christmas gift ideas and have an idea of something I could make for you, please do get then get in touch. I will need around 3 weeks to complete so if you want them by Christmas you need to have ordered by the end of November. 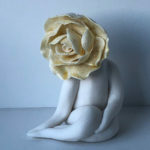 Come December I will only have sculptures to buy online via my shop, but not be able to take commissions for Christmas. However if you are reading this and it is the first week in December, do get in touch as I maybe close to a firing which means I could possible do a commission for you. The reason they take so long is that I only fill the kiln up when I have a few to fire. Also this is a part time job for me currently so I am only making my flower clay sculptures in the evening. I am hoping that one day I will be able to do this full time and the turn around will be much quicker. Also i get a lot of seconds or those that have hair line cracks which I class as seconds. So if I undertake a sculpture commission for you I will make about 2 or 3 to ensure you get one that is as perfect as it can be. I will happily take any returns if you are not happy of if it is not quite what you had in mind. 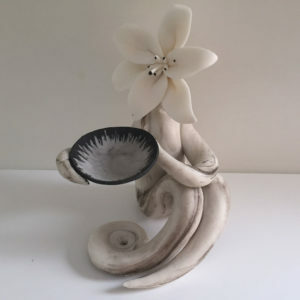 Also be aware that I am currently making my ceramics sculptures using Parian Clay, these only need firing once before they can be sold. Parian Clay is a marble like clay which is self glazing. I do use a porcelain clay with a clear glaze if that is your preference. Also I can paint them with underglaze or over glaze colour if you like. 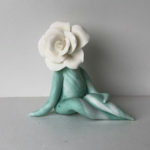 Most of my flower clay sculptures are white with a touch of colour. This is because I myself prefer them plain white as I think they look more contemporary, plus I sell more white However if you want unique Christmas presents and you want them coloured that is not a problem. 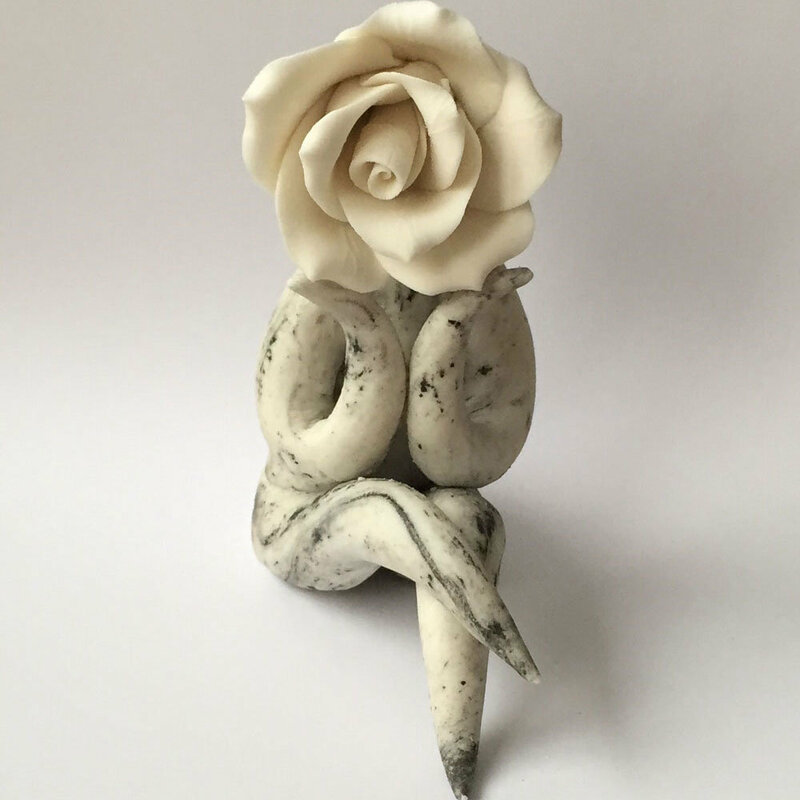 So if you want a rose sculpture or any other flower sculpture do get in touch. I like a challenge so if you have an idea but can’t see anything similar don’t think I can’t make it. I will try anything and I am always looking for new ideas.